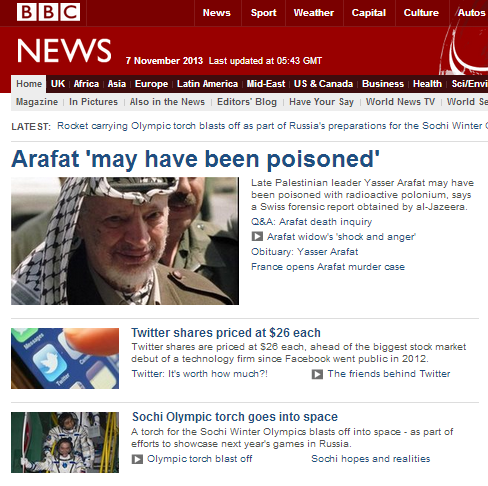 On November 6th the BBC News website once more went into Arafat overdose mode with no fewer than five articles presented on its homepage and Middle East page on that day alone. 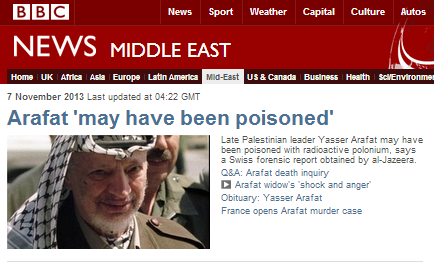 As well as the lead article – titled “Yasser Arafat ‘may have been poisoned with polonium’“- which includes a filmed report from Yolande Knell also broadcast on BBC television news, visitors to the website were offered an article titled “Q&A: Investigation into Yasser Arafat’s death” and a filmed Al Jazeera interview with Suha Arafat which promoted further links. 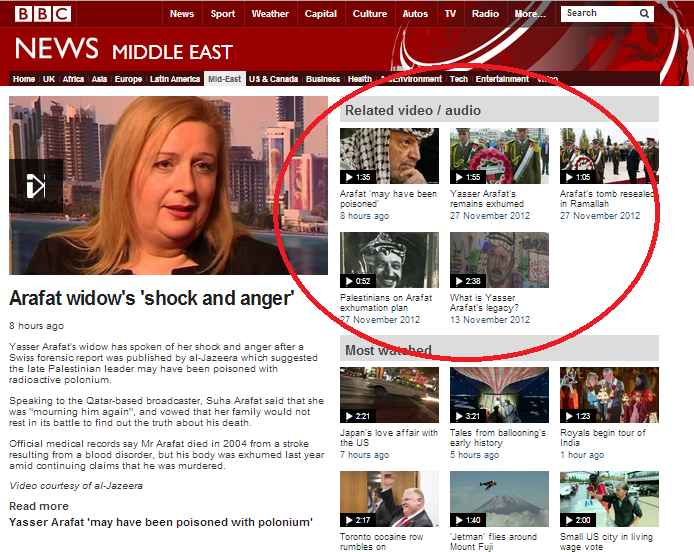 In addition to the above, suggested reading material included an article from August 2012 titled “Yasser Arafat: France opens murder inquiry” and the BBC’s own 2004 obituary for Arafat which whitewashes his role in terrorism and once again promotes the myth of an “unarmed” first Intifada. The main article, the Q&A, Knell’s filmed report and the August 2012 article all take the trouble to promote the speculation that Israel may have been involved in the as yet unproven poisoning of Arafat. “Many senior Palestinian officials claim that Arafat was poisoned by Israel. Israel’s prime minister at the time of Arafat’s death, Ariel Sharon, saw the Palestinian leader as a terrorist and an obstacle to peace. In 2002, Mr Sharon told the Maariv newspaper that he regretted not “eliminating” Arafat during the invasion of Lebanon in 1982. But he also stressed that Israel had later made a “commitment” not to harm him. However, Mr Sharon is alleged to have told former US President George W Bush in April 2004 that he no longer felt bound by his promise. Interestingly, the filmed interview with Suha Arafat appears to suggest that she has other ideas than those promoted by the BBC. Relevant questions also surround the aspects of this story not being adequately reported by the BBC. The scale of involvement of Qatar’s Al Jazeera in the creation and propagation of the story is confined to a few short sentences in the Q&A article. 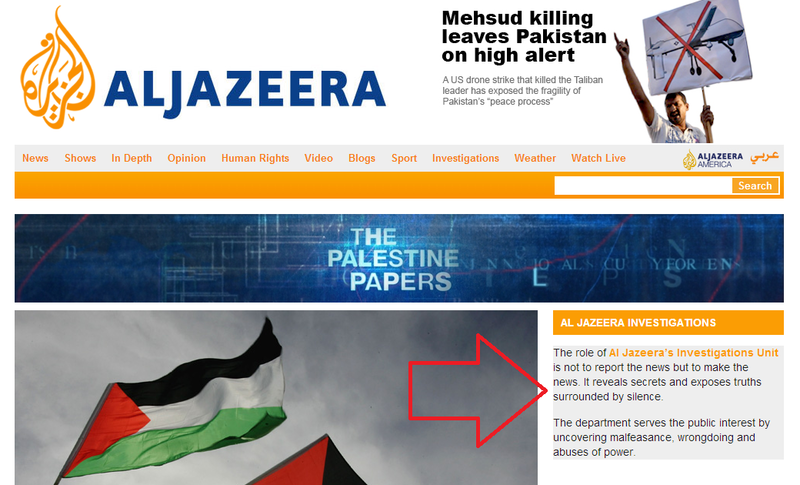 That report appears with the Al Jazeera logo, prompting the question of who paid for the tests to be carried out and why. It also shows that the claim that Al Jazeera “obtained” the report as stated in the by-lines highlighted above is inaccurate. The same article quotes British forensic scientist David Barclay without informing readers that he is apparently retained by Al Jazeera. The fact that Al Jazeera’s “documentary crew” is led by the head of its ‘Investigations Unit’ Clayton Swisher (who explains his motives for initiating the story here, complete with souvenir photo of himself hugging Arafat) and that Swisher was also behind the attempt to undermine the Palestinian Authority and derail the peace process with the Al Jazeera/Guardian publication of the leaked ‘Palestine Papers’ is not made clear to BBC audiences. As is only too well known, that self-defined remit does not of course extend to serving the public interest by exposing “wrongdoing” or “abuses of power” on the part of the Hamas-financing and sheltering Qatari regime – or even to expose the “secrets” of the extent of Al Jazeera’s own spheres of activity. Presumably, some sort of editorial discussion with regard to the appropriateness and implications of the extensive amplification of a manufactured story from a source with clear political motives (which, as the BBC has perhaps not yet grasped, extend far beyond the sideshow of Israel) must have taken place at the BBC. Apparently these five articles and the additional ones which followed the next day are the result of that discussion. So what if he was killed. It was long overdue. The BBC has hardly mentioned the poisoning in their bulletins – on Thursday’s lunchtime World a One it was totally ignored – given the huge publicity following Litvinenko’s death this is quite staggering!! A case of self (Zionist-influenced) censorship? Is the BBC pro-Palestinian? Don’t be ridiculous!! The World Service has a new programme called Outside Source or similar. It’s newsy, punchy and appears to try for balance. Remarkably, it even had a short clip two days ago of Netanyahu talking about Iran and sanctions. It had quite a bit to say about the death of Arafat but for some weird reason ommitted any mention of Suha Arafat’s claims of Palestinian involvement in his death. I guess when covering that story the BBC is taking its instructions from the PA.